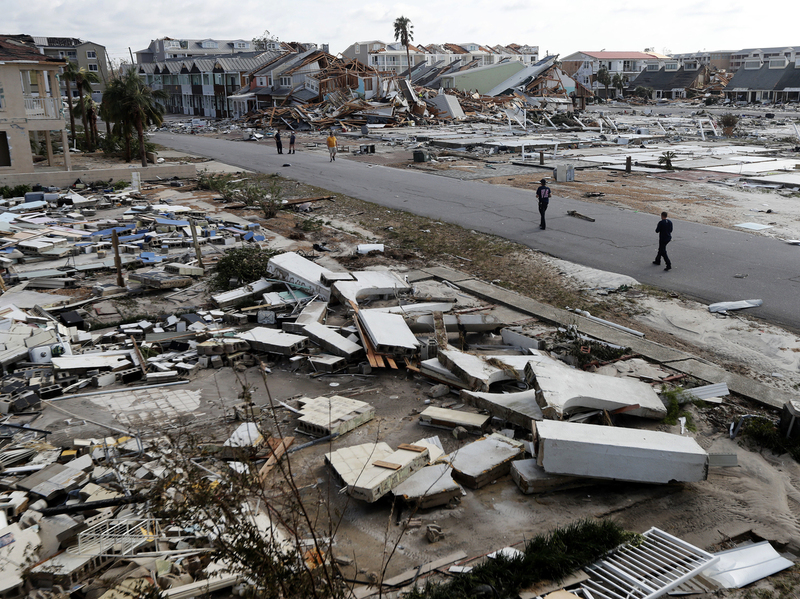 'This Is A War Zone': Hurricane Michael Leaves Deadly Trail Through Southeast More than 1 million people are without electricity, and areas along the Gulf Coast report severe outages of cellphone service and other communications. An aerial photo shows homes and businesses destroyed after Hurricane Michael smashed into Florida's northwest coast in Mexico Beach. The storm rampaged through Georgia and the Carolinas on Thursday. More than 1 million people are without electricity, and areas along the Gulf Coast and elsewhere report severe outages of cellphone service and other communications. As Michael moved through the Mid-Atlantic on Thursday and overnight, flash flood warnings were sent to people in towns from the coast to the slopes of the Appalachian Mountains. How Are You Coping With Hurricane Michael? As of noon ET Friday, the storm had left nearly 439,000 accounts without power outages in North Carolina, the state's Emergency Management Agency said. Around the same time, Virginia's emergency agency said more than 446,000 customers had no electricity. Those numbers are added to nearly 345,000 accounts without power in Florida and 150,000 in Georgia. Six Florida counties remain under curfews, as work crews try to push debris off roads so utility and emergency crews can start to repair the damage and reach people who need help after one of the most powerful storms ever to hit the U.S.
As one Panama City, Fla., resident told NPR's Debbie Elliott, "This whole town's destroyed." 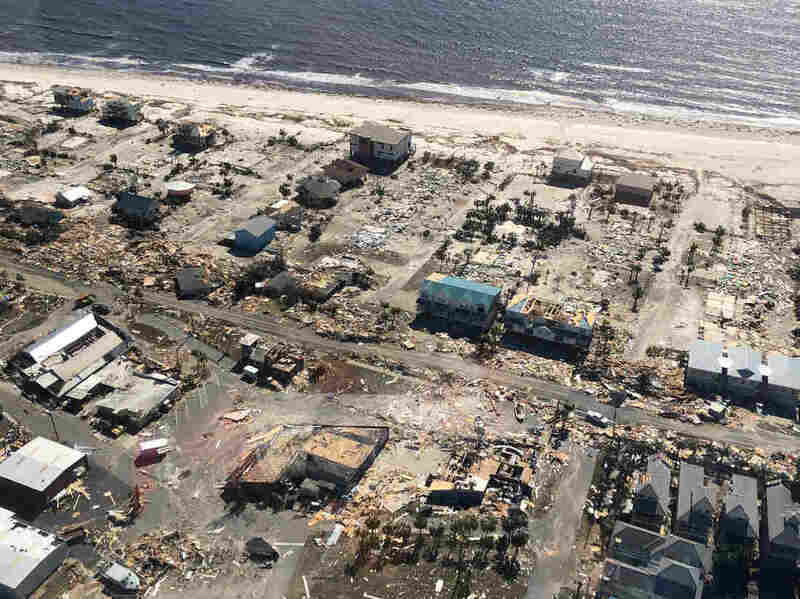 "This is a war zone," one Mexico Beach resident said of the damage left in the aftermath of Hurricane Michael. Florida Gov. Rick Scott said Friday morning that the state has "half a million gallons of fuel being distributed daily at 40 fueling stations to support our utility crews as they work around the clock to restore power." 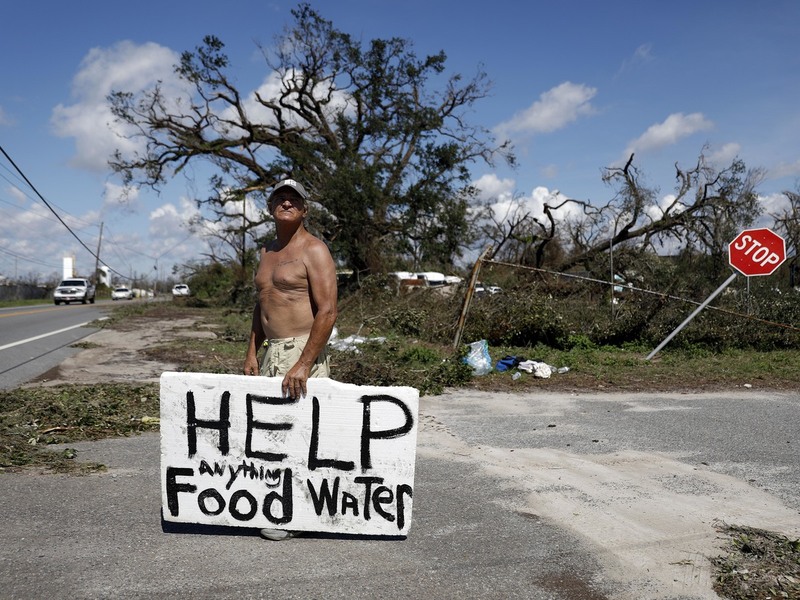 With many roads impassable, Scott says food and water "are being airdropped into the hardest-hit communities, and law enforcement are escorting resources on the road." Florida will give each of the impacted counties 200 generators, so they can power their traffic lights, Scott said. Even in areas that have been declared safe, officials are warning residents to drive only in the daytime, when they can see downed power lines and other hazards. Some of the hardest-hit places are Mexico Beach and other communities along the Panhandle, where Michael razed buildings, snapped huge trees in half and threw debris over roads. "Before, it was paradise," Mexico Beach resident Lance Hanson told NPR's Greg Allen. "It was the most beautiful, secret location you could have for a vacation. The best beach in the world." Hanson stayed in his family's house one block from the beach to ride out the storm, along with his uncle and 98-year-old grandmother. As Allen reports, "The storm blew off much of the roof, but the nightmare, as he calls it, didn't end there. Houses where the gas was left on caught fire in Mexico Beach, threatening to burn down the entire neighborhood." Mexico Beach, close to where Michael made landfall just short of a Category 5 hurricane, was devastated by the storm. Some houses were simply wiped off their foundations, with wreckage and sand covering the ground and streets. "This is a war zone. How are you going to get out of here?" Hanson asked. "This city is destroyed. The whole area ... they're going to tear down these houses and rebuild it. You're not going to recognize Mexico Beach." Many of the beach's residents followed evacuation orders. As for why Hanson and others stayed behind, Allen says he spoke to one man who "faulted the National Hurricane Center and the news media for not providing a more accurate forecast." Others said they remained because road closures and police checkpoints make it very hard to get back home. The intense power of Michael caught many people off guard. It quickly bloomed from a "disturbance" with winds of 30 mph on Saturday afternoon into a fearsome storm with gusts over 170 mph. As it kept gaining strength, hurricane forecasters said, it "defie[d] traditional logic." A bit of good news emerged around noon on Friday in Tallahassee, where the storm felled thousands of its famous oaks and other trees, damaging houses and blocking roads. "All major roadways are passable," the city said, adding that 83 percent of its traffic signals were operating normally. 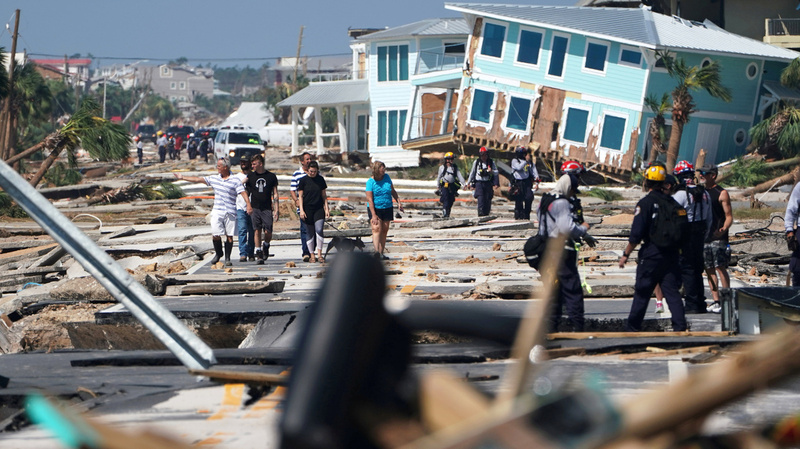 Rescue personnel walk through debris in Mexico Beach, which was devastated by Hurricane Michael. In Georgia, some of the worst damage hit the southwestern section of the state, where it devastated farms at a particularly vulnerable time of the year. "Hurricane Michael arrived before most of the state farmers had started harvest for the season — specifically for pecans, peanuts and cotton," Tasnim Shamma reported from Atlanta member station WABE, for NPR's Newscast unit. "It is our worst dream being realized," Agriculture Commissioner Gary Black said. "I have seen cotton that was being harvested yesterday. It was an outstanding yield of three bales an acre. You cannot tell where he stopped harvest and where the rest of it was being harvested by the storm." More than 50 poultry houses were also destroyed, officials say. Even with the worst of the storm now past, flooding remains a threat, as overwhelmed river systems struggle to cope with massive amounts of water. Michael Williams, 70, looks for help from passing motorists as downed trees prevent him from driving out of his damaged home in Springfield, Fla., in the aftermath of Hurricane Michael on Thursday. "I don't know what I'm going to do," he said. Of the five deaths in Virginia, four were from drowning, according to member station WVTF. It adds that Hanover County firefighter Lt. Brad Clark was killed and several others were injured when a tractor-trailer rear-ended a fire truck that was stopped at a crash site. In Virginia, the National Weather Service said on Friday, "significant river flooding is occurring or forecast on the Appomattox River and possibly even on the lower James River." Early Friday morning, Michael was dropping rain along the Mid-Atlantic and New England coasts as it moved eastward over the ocean, with sustained winds that had strengthened to 65 mph. "All coastal tropical cyclone warnings and watches are discontinued," the National Hurricane Center said on Friday morning, adding, "There are no coastal watches or warnings in effect."